Stainless steel head with ashwood handle. 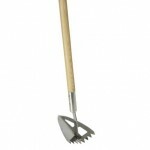 Pointed head allows for easy ground penetration. Wide teeth allow for even dispersal of material. Holes on the side allow for material to pass through.